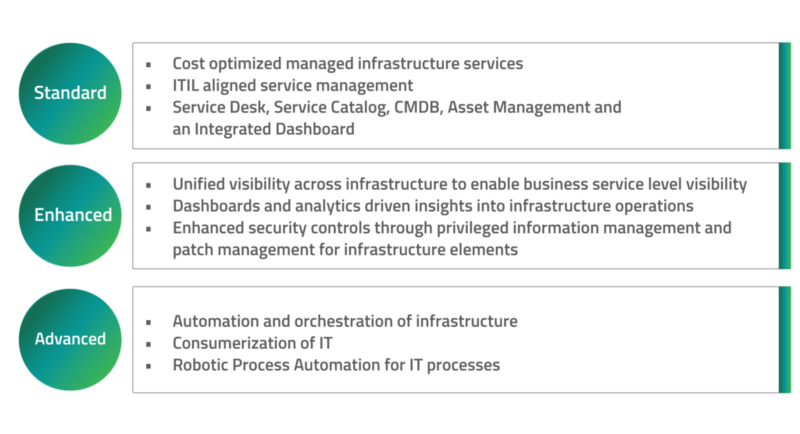 Traditionally, Enterprises have relied on Managed Infrastructure Service Providers (MSP) to get standardized and cost efficient services which allows Enterprises to focus on their core business while minimizing risk, increasing infrastructure up time and gain access to newer technologies. The rapid pace of adoption of Digital technologies has changed the expectations of Enterprises which requires MSPs to deliver much higher value by becoming trusted partners and enablers in the Digital Journey of Enterprises. Happiest Minds Managed Infrastructure Services consists of comprehensive, integrated suite of services to manage an Enterprise’s distributed and Hybrid IT environment as a single entity with single point-of accountability. Happiest Minds leverages its proven transition process to ensure a smooth start of systems support services and be operational keeping criticality of operations in mind and to ensure minimal impact to operations and service levels. During Steady State Operations, Service Improvement Plans and initiatives are carried out along with support for technology transformation projects. Happiest Minds managed infrastructure services consists of comprehensive and modular services components. 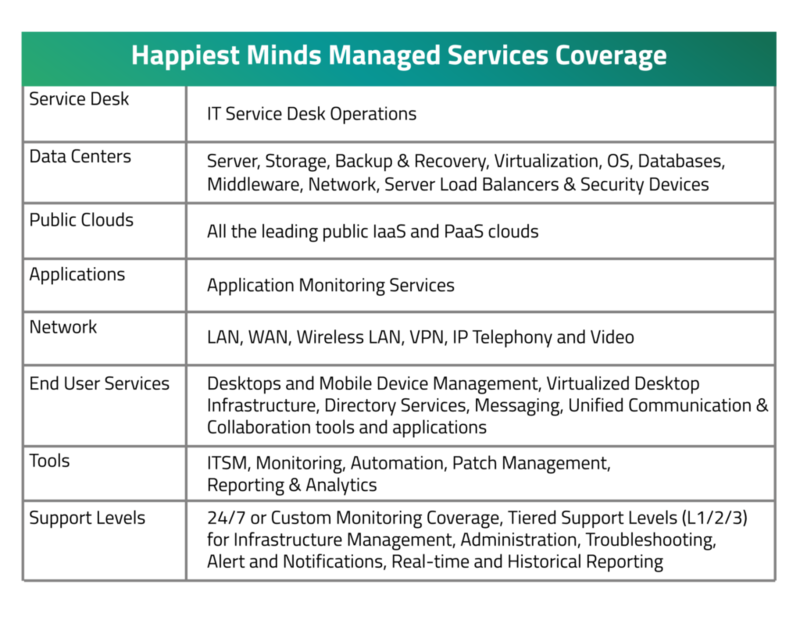 Along with flexible engagement and pricing models, Happiest Minds leverages ELLIPSE, its Next-Gen Managed Platform to provide multiple service tiers to deliver high value solutions to Enterprises. A Next-Gen Managed Services Platform that provides provide multiple service tiers to deliver high value solutions to Enterprises…..